Typically less than 1% cross reactivity against other types of apoLipoprotein was detected by ELISA. 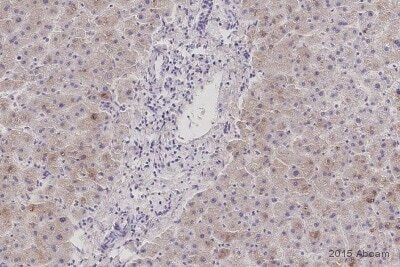 This antibody reacts with human apoLipoprotein B and has negligible cross-reactivity with Type A-I, A-II, C-I, C-II, C-III, E and J apoLipoproteins. Full length native apoLipoprotein Type B (purified). This antibody has been used to determine that atherosclerotic lesions in the human aorta contain considerable amounts of lipoproteins. These lipoproteins were observed to be complexed with components of the extracellular matrix (especially LDL and proteoglycans). The role of these matrix-lipoprotein complexes is not entirely clear, however, animal models of atherosclerosis have shown that increased cellular proliferation and increased production of extracellular matrix components occur following injury to the intimal layer of the aorta. At least 9 distinct polymorphic forms of apolipoproteins are known. The apolipoproteins act as stabilizers of the intact lipoprotein particles. Quantitative measurements of HDL, LDL and VLDL particles in human serum are often used to estimate an individuals' relative risk of coronary heart disease. In addition, quantitative immunological measurements of certain apolipoproteins (especially A-1 and B) have been suggested to be more accurate estimators of coronary heart disease than measurements of lipoprotein particles (especially HDL and LDL). Abcam's apo-lipoproteins are derived from human plasma by density gradient ultracentrifugation and HPLC. This product has been prepared by immunoaffinity chromatography using immobilized antigens followed by extensive cross-adsorption against other apoLipoproteins and human serum proteins to remove any unwanted specificities. Our Abpromise guarantee covers the use of ab7616 in the following tested applications. Dot blot 1/5000 - 1/10000. Defects in APOB associated with defects in other genes (polygenic) can contribute to hypocholesterolemia. Palmitoylated; structural requirement for proper assembly of the hydrophobic core of the lipoprotein particle. 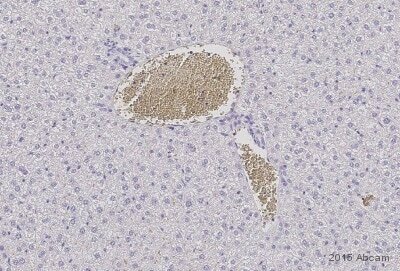 ab7616 stained HepG2 cells. The cells were 4% formaldehyde fixed (10 min) and then incubated in 1%BSA / 10% normal donkey serum / 0.3M glycine in 0.1% PBS-Tween for 1h to permeabilise the cells and block non-specific protein-protein interactions. The cells were then incubated with the antibody ab7616 at 5µg/ml overnight at +4°C. 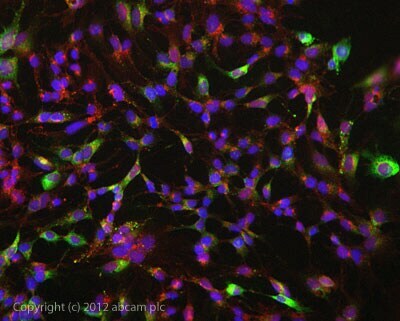 The secondary antibody (green) was DyLight® 488 donkey anti- goat IgG (H+L) used at a 1/1000 dilution for 1h. Alexa Fluor® 594 WGA was used to label plasma membranes (red) at a 1/200 dilution for 1h. DAPI was used to stain the cell nuclei (blue) at a concentration of 1.43µM. Publishing research using ab7616? Please let us know so that we can cite the reference in this datasheet. Kindly provide additional information about the conditions of WB that is shown in the image in the datasheet including the gel used. Kindly provide additional information about the conditions of WB that is shown in the image in the datasheet. Ab77859 was used at 0.01 ug as shown in the WB. When we used the protein at higher concentration the lane was overloaded. The membrane was blocked blocked for 1 hour at room temperature with 5% BSA in 0.1% TBST, with gentle rocking. Primary antibody was then diluted (1 µg/ml) with 5% BSA in 0.1% TBST and incubated overnight at 4°C with gentle rocking. The membrane was washed and incubated with Rabbit polyclonal to Goat IgG - H&L - Pre-Adsorbed (HRP) (ab65486) at 1/3000 diluted with 5% BSA in 0.1% TBST with gentle rocking for 1 hour. Do we have antiboduies suitable for immunoturbidimetry? ELISA or IP abs should work. Tatsächlich hat eine meiner Kolleginnen mit der Turbidimetrie gearbeitet, und nach einiger Diskussion sind wir der Meinung, dass für Ihren Kunden Antikörper, die in ELISA und/oder IP funktionieren, geeignet sein sollte. Allerdings habe ich nichts für das CRP gefunden. A customer would like to askquestion about the specificity ofab7616. Whether ab7616 could react with Apo B48 and B100? Would you please help to answer? Thank you for your help! We have not mapped the epitope for ab7616 and have not tested the antibody against Apo B48 and B100. We have no information about the cross reactivity to Apo B48 and B100. I am sorry for not being able to provide you useful information this time. Please do not hesitate to contact us if you need any more advice or information in other aspects. Answer for your questions: In immunodiffusion test we use 0.8%agar on GelBond film.Ag and Ab are applied to holes punched in agar gels.Plasma samples from mice 5ul/hole and Ab(7616)dil.1/2(5ul).After inc(ON)the precipitin bands are visualized by staining with Comassie BrilliantBlue. Question 2:no signal Question 5 : no I don´t have the batch number of the Ab which were" successful"
Thank you for getting back to us with further details. I am handling Charlottes enquiries in her absence. Once again I am sorry to hear that you have been having difficulties with this antibody. The problems that you have been having with this antibody very much sound like a batch problem. I would be very grateful if you could provide me with some further details. If you could obtain some ordering information I would be able to trace the batches (good and bar) that you have used and I would certainly be prepared to provide you with a replacement vial; provided that the antibody was purchased within the past 90 days. I look forward to hearing from you. I am interested in using one of your antibodies (ab7616) to bind LDL in media and prevent it from binding to the LDLR. Can you please tell me where the ab7616 binds to the apob100 lipoprotein and if it could be used in such a way? Thank you for your enquiry. This is a polyclonal antibody and will therefore consist of a mixed population of IgGs each of which will recognise a different epitope. I am not sure that the antibody can be used to prevent the Apo B100 antibody from binding to the LDL receptor, since the epitopes recognized by the antibody may not be on a portion of the protein involved in receptor binding. I hope this information helps, please do not hesitate to contact us if you need any more advice or information. When this antibody was tested for application in Western blotting, what type of lysate was used for characterization? Thank you for your enquiry. When ab7616 was tested for application in Western blotting, it was tested against purified Apo B protein, which would be recommended as a positive control. If you have any additional questions, please contact us again. I was wondering if the antibody to apolipoprotein B-100 that you sell is equal in fuction to the antibody to apolipoprotein B-100 produced by Polymedco (JI-H). Their antibody binds to the 51st residue of the protein. Do you have something like this? Thank you for your email. Ab7616 was made against the whole apo B and should be able to recognize all the residues. I'm not familiar with the antibody from Polymedco, so unfortunately can't state how this antibody works in comparison. If you have any more questions, please contact us again.